From the developer of Crazy Kings! Create your army and battle hordes of evil in this glorious combination of Tower Defense, RPG, and Collectible Card Game! COLLECTIBLE CARD GAME MEETS TOWER DEFENSE! 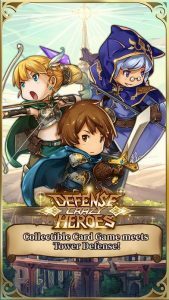 500+ LEVELS TO TEST YOUR METTLE AND MIND FOR TACTICS! BUILD A POWERFUL CLAN WITH WORLDWIDE PLAYERS! TEST YOUR SKILLS WITH DAILY AND WEEKLY CHALLENGES! CONQUER BATTLEFIELDS AND SCAVENGE THE SPOILS OF WAR! 20+ UNIQUE, UPGRADEABLE HEROES READY TO BREAK SKULLS! AN ARSENAL OF SPELLS AT YOUR COMMAND! KINGLY REWARDS AWAIT YOU IN QUESTS AND CHALLENGES!